The Raut was designed by Lucas Burnley, a custom knifemaker out of Orleans, MA, and produced by Viper Knives out of Maniago, Italy. "Produced in Maniago, Italy" is the theme of the entire enterprise for MKM, which is aptly named. This "brand" is a collection of four of the top knife manufacturers in Italy working together to consolidate and strengthen their commercial contributions to foreign markets. The Raut is the kind of knife you want at by your side when you don't know where your day will take you. Its compact size makes it easy to carry while the versatile blade allows for both utility and tactical tasks alike. What makes this Lucas Burnley design different is that it's available with both traditional and front flipper opening methods or as strictly a front flipper. Each rides on ball bearings for that smooth, buttery feeling you always look for in a knife and are available in a number of different handle options. 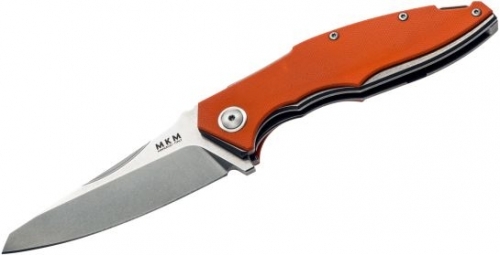 MKM calls it a Hybrid locking system; concealed and elegant like a liner lock but thick and strong like a frame lock, and it does its job very well. The ergonomics of the Raut put the cutting edge in line with the knuckles for more power with less effort and we absolutely love this about the design. Add in a titanium backspacer and pocket clip and the complete package is something we highly recommend to you as it covers all the cutting bases extremely well.